SOPAC Zone Annual Meeting POSTPONED! Tonights Annual Zone Meeting has been postponed. The meeting will be rescheduled for sometime in January (date pending) and will include the newly appointed Zone Board Members. Sorry for the inconvenience and we hope to see you in January! 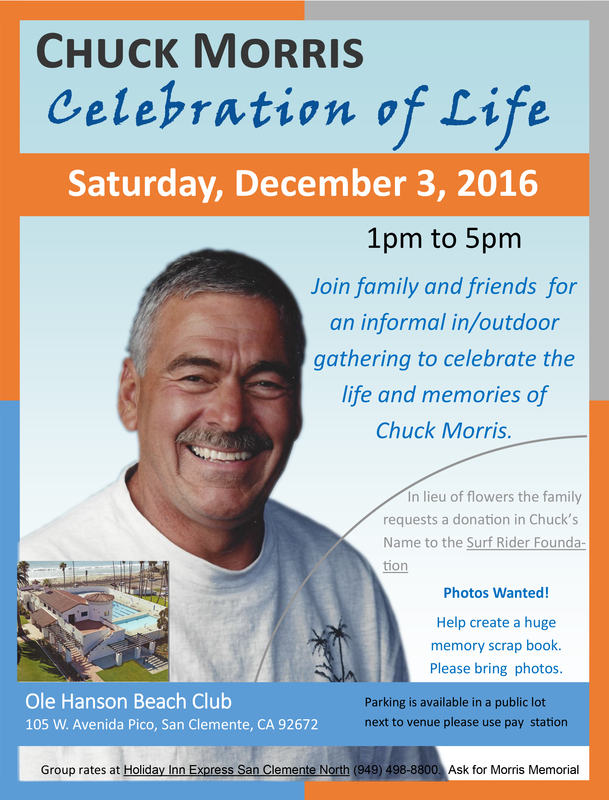 The Water Polo community morns the loss of Chuck Morris, University High School teacher, Water Polo and Swimming coach who passed away on December 10th unexpectedly and suddenly. Morris had a teaching and coaching career that spanned over 30 years. He was the first Water Polo and Swimming coach at University High School. He started the program from scratch in 1971. His first year, he conducted practices borrowing pool time from neighboring Tustin High School and location community pools until the campus pool was constructed in 1972. The team went from forming to league champions in 2 years winning the Orange League in 1973 and 1974 and many years after. Morris was the first coach in school history to win a CIF (3A) championship in 1974. The 1974 team was the beginning of a long run for Coach Morris as a respected Water Polo powerhouse in Southern California. The Morris program created Water Polo All-American's, National team members and Olympians, such as Peter Campbell who was a member of the 1988 silver medal Water Polo team. Morris retired from teaching and coaching in 2004 and led an active life in retirement. His legacy is the hundreds of student-athletes that grew up in his program and credit Morris as a prominent person in their lives. He is survived by his wife Kathy, his 3 kids and several grand kids. The Southern Pacific Zone is currently preparing to hold its zone board election. There are currently three (3) board member positions to be filled and this is an opportunity for you to get involved with water polo at the local level. As outlined in the USAWP Zone Policies and Procedures, the new zone board will be elected by the zone membership. Once online voting is complete, the new zone board will then meet and elect the needed zone officers. Deadline for nominations submission is Friday, November 11th. November 15, 2016 - Voting instructions and slate of candidates sent to eligible voting members in the zone. • be affiliated with a water polo club within the Zone in which the individual is voting or, if a member is not affiliated with any water polo club, have their principal place of residence within the Zone in which the election is being held. A member may vote in only one Zone in any election year. Nominations are due by November 11, 2016. Please see attached file for Nominations and their descriptions. Zone seeking Delegates for USA WP General Assembly! The SOPAC Zone is looking for 3 Delegates to send to the USAWP General Assembly in LA on March 4 & 5. The Zone needs to send three members as well as a Zone Chair and Zone Ref. Please contact mcousineau@usawaterpolo.org if you are interested in representing the SOPAC Zone at the USAWP General Assembly. SOPAC Zone Annual Meeting Reminder! The Sopac Zone will hold its Annual Meeting on December 12, 2016 from 6 pm to 8 pm at Lampost Pizza at 1829 E Chapman Ave in Orange California. The annual meeting is a chance to discuss what the Zone does on an annual basis and provide your input into our programs and events. We will also be reviewing the sanctions and event calendar for the 2017 year. GAMES: 7-minute quarters for OPEN, 6-minute for 40+ CLASSIC. 4-5 games per team; no Friday games. 1st Annual event honoring Bob Nealy, who passed away September 1, 2016 from a long and exhaustive battle with lymphoma. Bob would have been 71 on Halloween of 2016. In 1959, he began playing water polo at Newport Harbor High School, which eventually led him to a collegiate career at Orange Coast College and then UC Irvine. Blending his passion for the pool and the surf, Nealy started teaching at San Clemente High School in 1970 and later at Capo Valley. He taught American Cultures, US History, Contemporary World Problems, and Wilderness Living. He was also involved in the surf and ski clubs at SCHS and CVHS. Starting in 1998, he coached the Frosh-Soph and JV girls and boys water polo teams at SCHS. In 2003, he moved to Tesoro High school and after 34 years as an educator, he retired in 2005. Never giving up on his passion for water polo, Nealy would periodically drop by the high schools’ practices and get in the pool with the aspiring young athletes. After retiring from CUSD, Nealy kept surfing and got back into playing masters water polo. In 2011, Nealy received the Bryan Weaver Male Master of the Year Award from United States Water Polo (USAWP) for his involvement with masters water polo. He was also inducted into the UC Irvine Hall of Fame for swimming and water polo. “He cites water polo in giving him a psychological advantage in battling his illness, still being able to do what he loves—play water polo,” noted USWP when honoring Nealy. His grace and class will be greatly missed throughout the San Clemente community, where he spent most of his life. He leaves his wife, Sara, and son, Trevor, behind. Bob had found a way to turn his passions into a business. His company SURFMORE has been a leader in the development of surf leases and has become a worldwide giant in the surf accessory industry. The first team listed shall wear white caps and sit to the left of the score table from the vantage point of someone sitting at the score table. Teams shall switch ends at halftime; the rules do not allow for switching ends each period. ALL BREAKS, INCLUDING HALF-TIME SHALL BE 2 MINUTES IN DURATION. The women's size ball will be used for the WOMENS OPEN and 40+ CLASSIC; Men's size for MENS OPEN. All games must have a winner, going directly to shootout after regulation if necessary. RED CARDS: Any COACH receiving a red card shall be required to sit out the next game for that team in that division, AND ALL GAMES IN BETWEEN IN THE EVENT THAT COACH IS COACHING ANOTHER TEAM IN ANOTHER DIVISION. RED CARDS: Any PLAYER receiving a red card shall be required to sit out the next game for that team in that division, AND ALL GAMES IN BETWEEN IN THE EVENT THAT PLAYER IS PLAYING IN ANOTHER DIVISION. BRUTALITIES: Any PLAYER receiving a brutality shall be required to sit out the next game for that team in that division, AND ALL GAMES IN BETWEEN IN THE EVENT THAT PLAYER IS PLAYING IN ANOTHER DIVISION. ROSTERS: All rosters must be verified using the USA Water Polo roster verification online system. Log in to your USA Water Polo club admin account, then click on Rosters, then find the event in the non-national sanctioned events drop down. You must also hand in a score sheet along with your verified roster prior to each of your games. You are able to print a score sheet from the USAWP roster verification system. Please enter below, then click continue. On the next page you will be asked to verify and enter or come back to this page to change anything before going back to verify once again and continue on with the entry process. All entries are subject to availability. If you need additional information or have a question that is not answered above please contact nick@irvinewaterpolo.org. November 11-13, 2016 Honolulu, HI. Please visit CHAMPIONS CUP information page regarding the upcoming 14 & Under Champions Cup. Tournament take place on the campuses of The Punahou School and The ‘Iolani School. Entry Deadline is September 30, 2016. Roster deadline is October 28th. Gold Membership, birthdate verification and club affiliation is required for this tournament. October 21-23, 2016 Mesa, AZ. Please visit ROCK-TOBER information page regarding the upcoming PCA Rock-tober Classic. This event is a 12 & Under Mixed tournament with a Positive Coaching Alliance emphasis. It is designed to give our younger athletes an introduction to a national championship tournament, while providing a safe environment in which to learn. Entry deadline is September 30, 20156. Roster Deadline is October 7, 2016. There is no affiliation requirement for Rock-tober PCA Classic, Gold membership and birthdate verification are required. The Zone will be nominating Coaching, Referee, Volunteer among other award winners who will receive a certificate from USAWP recognizing their work. National award winners will be invited to the USAWP HOF Awards Dinner.